In my last two posts, I highlighted substantial problems with the historical narrative and use of sources in Nancy MacLean’s Democracy in Chains, particularly as they concerned the issue of segregation in 1950s and 60s Virginia. MacLean essentially claims that economists James M. Buchanan and Warren Nutter forged something of an unholy alliance with a group of segregationists in 1959 for the purpose of advancing a libertarian school voucher scheme at the expense of black students. Her entire account of these events should be called into question due to its severe historical errors and problems of evidence. First, she erroneously suggested that the two economists were coordinating their work on school vouchers with segregationist newspaper editor James J. Kilpatrick of the Richmond News-Leader. In reality, they were working with Virginius Dabney of the Richmond Times-Dispatch, who actually published the Buchanan-Nutter article. Significantly, Dabney was a moderate supporter of “limited integration” with a long record of backing civil rights causes. Second, she misrepresents the content of a cover letter from the release of the article to suggest its authors’ callous indifference to black students. In reality, the phrase she quoted is an excerpt of a passage where Buchanan and Nutter were describing their low estimation of the discourse in the Virginia legislature itself. 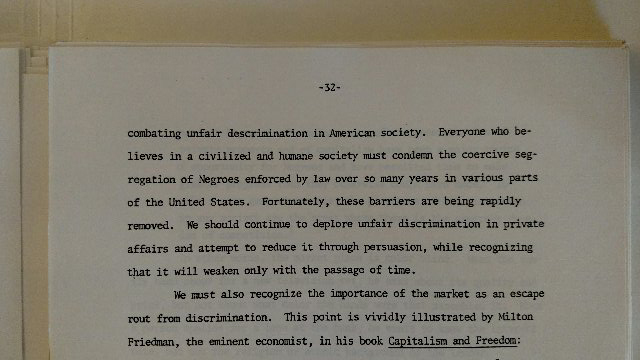 But where did Buchanan and Nutter themselves stand on segregation? They actually answered that question, albeit briefly, in the 1959 paper by stating their opposition to the institution in the opening paragraphs. But both men were economists who worked primarily on other areas of research so they did not write very often in general on the topic of race. MacLean exploits this relative silence (along with convenient omissions of additional evidence contradicting her thesis) to poison the well against Buchanan and Nutter. She does not need to call them segregationists outright and can even plead ignorance of knowing where they stood, because she has already painted them with numerous guilty associations – including false ones that her cited sources do not support. “Everyone who believes in a civilized and humane society must condemn the coercive segregation of Negroes enforced by law over so many years in various parts of the United States. Fortunately, these barriers are being rapidly removed. We should continue to deplore unfair discrimination in private affairs and attempt to reduce it through persuasion, while recognizing that it will weaken only with the passage of time. Given her own politics, it is highly unlikely that Nancy MacLean would agree with the specific arguments that Nutter or Friedman made about the role of markets in combating racist institutions. But disagreement on the means of ending discrimination does not get her around the fact that Nutter unambiguously denounced the institution of segregation and articulated a route of undermining its evils. So yet again, we have clear archival evidence that runs counter to MacLean’s core narrative on the role of segregation in the “Virginia School’s” origin story. It is one of many examples that have come to light since the publication of Democracy in Chains earlier this summer. 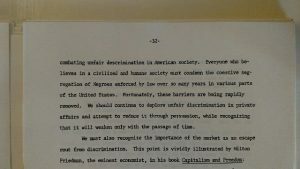 Two more letters from Buchanan (albeit written several years later) that were uncovered last month by Georg Vanberg similarly revealed his opposition to segregation in specific relation to the voucher issue. While I do believe that MacLean’s book was inexcusably sloppy in its handling of evidence, it remains possible that she was not aware of the Nutter lecture to the ABA. That’s fine, but scholarly integrity also obliges historians to correct and amend their findings when new evidence comes to light that directly challenges a previous interpretation. We now have extensive archival evidence undermining MacLean’s central thesis about the relationship between the Virginia School and segregation. It’s time to amend that thesis. 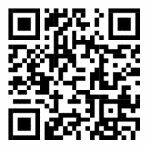 This entry was posted by Phillip W. Magness on Saturday, September 30th, 2017 at 3:05 pm	and is filed under Uncategorized. You can follow any responses to this entry through the RSS 2.0 feed. Both comments and pings are currently closed.